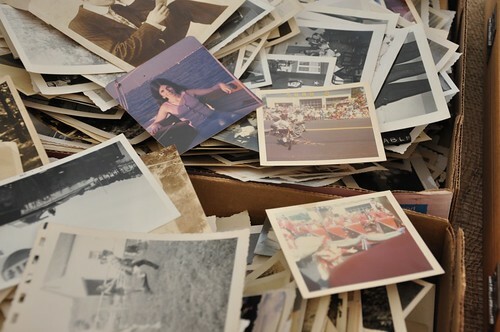 The Brimfield Antiques Show is the largest outdoor antiques show in the world, with over 6,000 dealers and 130,000+ visitors during the course of of one week- in May, July and September. 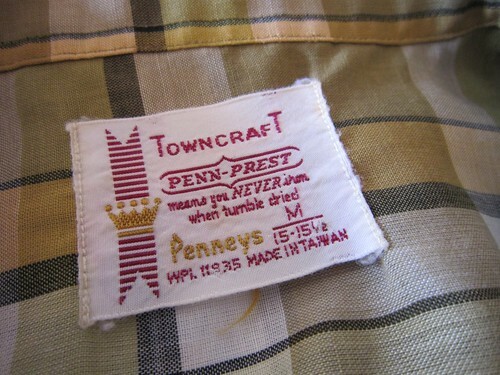 So if you want to be overwhelmed by the volume of vintage antique and cool old stuff to choose from, this is your place! My pilgrimage to Brimfield this year was twofold- one to have an excuse to tell you RetroRoadmap readers about it, and two, to pay homage to the family tradition of attending Brimfield with my dad (who passed away last fall). 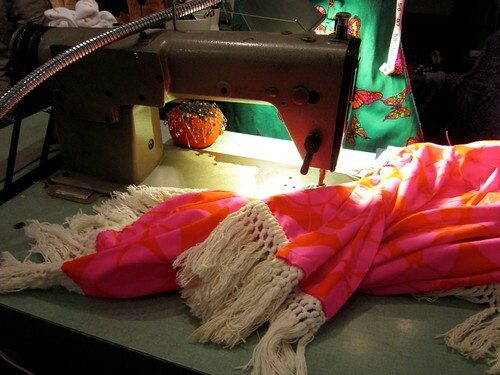 In business since 1962 J & O Fabrics in Pennsauken NJ is an absolute must-stop if your looking for the perfect fabric for your tiki lounge, bowling shirt, roller skating skirt or perhaps curtains for your vintage camper. 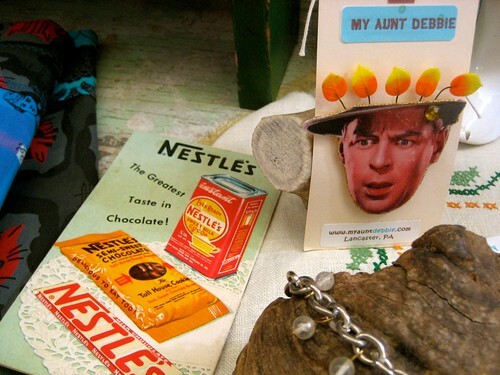 All of these crafty concepts came to mind as I wandered down aisles and aisles of vintage inspired prints in their giant showroom on route 130 in Pennsauken PA. 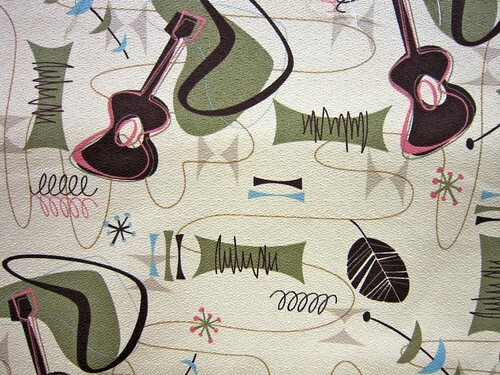 Check out the vintage inspired fabric and more at J&O- click here to read on! 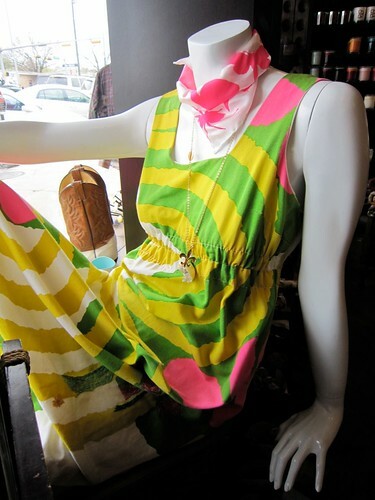 Cream Vintage Austin, TX – Fab Vintage Clothing and On-Site Alterations – Mod Betty Swoons! My pal Leah sent me a wonderful brochure of the great vintage shops in Austin, TX and while I was only able to visit one of them – Cream Vintage on South Congress – it was a RetroRoadmap highlight of our short visit to that hip town. 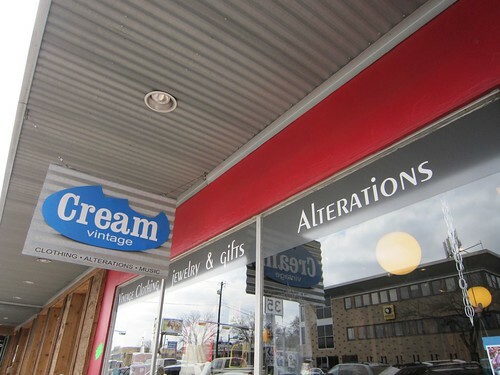 Not only did they have a great selection of affordably priced vintage clothing, but here’s the best part – on-site alterations, practically while you wait! If you’ve ever been vintage or thrift shopping and tried something on to find doesn’t fit like you hoped it would, this place is a vintage clothing lover’s dream come true! And the price? Tres affordable. I loved a great tiki dress I tried on (perfect for our annual luau) but it was baggy around the shoulders. Usually I’d leave it behind, or buy it thinking, “some day I’ll get this altered” and add it to the pile of clothes that never gets altered. But not here! A few pins here, a few chalkmarks there and within moments we saw how simple it was to fit this mod tog to my own bod. So while Austin has plenty of vintage stores and I could kick myself for not having time to go to more of ’em I’m SO glad I popped into Cream Vintage. I promise to post a photo of me at the luau in my mod tog! UPDATE Sat 1/22 – here’s a link to a Facebook post from the daughter of Zap & Co’s owner, Steve Murray – he’d badly burned and injured but in stable condition. Please send healing thoughts his way, and towards his family as well. We have just learned that Zap & Co. of Lancaster PA – established in 1973 and claiming to be the nation’s oldest vintage clothing store, burned down last night, and there are reports that owner Steve Murray has been hospitalized. We had plans to visit Zap & Co. for RetroRoadmap next Friday night (RetroRoadhusband has a gig down the street) – so this goes to show, once again – go out and visit the places that mean a lot to you -they might not be there tomorrow! Our thoughts go out to Steve and everyone who was impacted by this sad occurance. In learning more about the fire it appears that they don’t know what started the fire, and may never know because the building is too dangerous to enter and they’re demolishing it. Owner Steve Murray is in the hospital in critical but stable condition. I am thrilled to report that two of the places I wrote back in the day about for my Bystander Unchained column are still going strong! 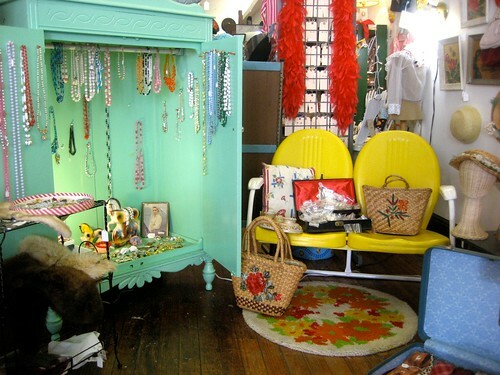 First up we have the vintage costume jewelry and accessories mecca, The Millsboro Bazaar in Millsboro Delaware. 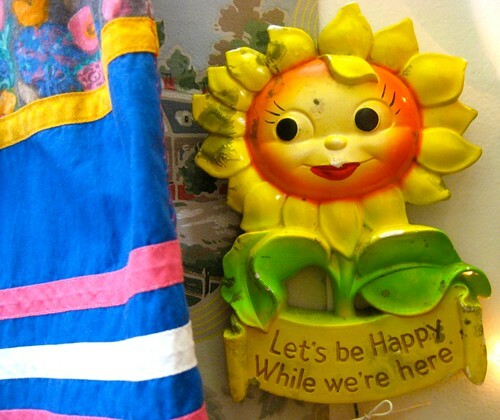 I was in luck today when owner Dave Mayer was behind the counter and I was able to catch up with him to see if anything had changed since the last time I wrote about his emporium of vintage housewares, vintage clothing and vintage jewelry. Now celebrating his 20th year in this location, business is just swell, which was heartening to hear, with this economic climate. The jewel in the crown of the Millsboro DE Main Street antiques selection is the Millsboro Bazaar, especially if your favorite jewel is a big glittery rhinestone. 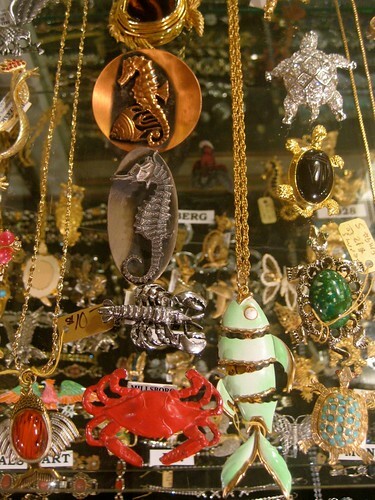 Owned and operated for over 14 years by sole proprietor Dave Mayer, the Bazaar is home to what could easily be the largest selection of costume jewelry on the East Coast. Dave confides in us that he probably has as much in storage as he does on display- which is mind boggling as you begin to examine case after case of baubles, brooches and bright shiny bangles. If you like to adorn your abode as well as your bod this is the place to go for mid-century (20th, of course) dish’n’glassware, furniture, lamps and ephemera. Don’t forget to check out the bargain basement and as-is room too! Everything in the place is neat and attractively arranged, making it easy to furnish your retro beachside bungalow in one visit. 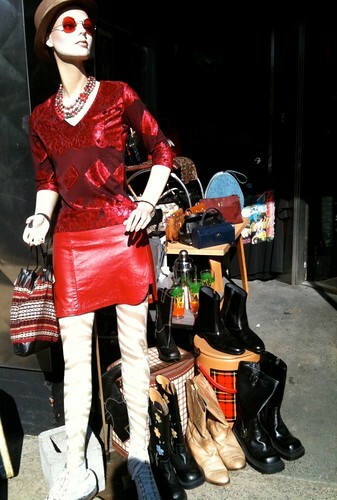 Speaking of your mod bod, head up to the second level and you will find vintage clothing at every turn. The ceiling almost totally obscured by colorful hats, there are rooms filled with clothes for guys and gals. Whether you are Twiggy skinny or broad where a broad should be broad, there is bound to be something here from the era when your body type was in vogue. Find something to flatter your figure! There always seems to be a sale of sorts going on at the Bazaar, so it is easy to coordinate an ensemble from hat to shoe without emptying out your vintage purse. Also you can rest assured that you will not see someone wearing togs like yours when you are out and about- can’t guarantee that at the mall. 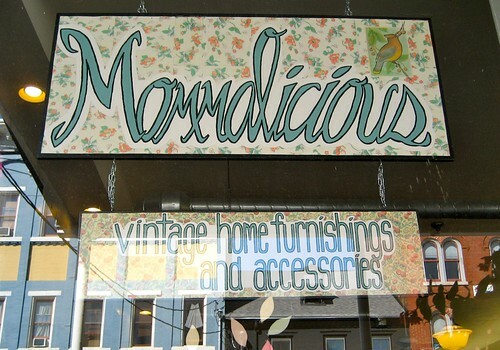 Mommalicious Lancaster PA – A Fave Vintage Shop! As you can see from some of the photo posts I’ve made, RRH (RetroRoadHusband) and I have been doing some traveling, and that can put a cramp on the time I have to write about some of the neat places I’ve visited lately. 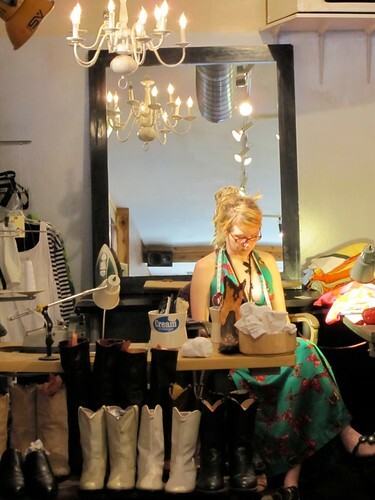 I’ve been eager for some down time to give one of my very fave places my undivided attention, and that is why it’s been a wait between my visit to the wonderful vintage shop Mommalicious / Smilin’ Gal / My Aunt Debbie in downtown Lancaster PA and this writeup. I wanted to make sure I had the time and concentration to be able to convey how swell this place is! “Mommalicious!” exclaimed by a dear pal of owner Alicia Byler when Alicia had a bun in the oven a few years ago. “Mom Alicia” kept the moniker and now uses it to brand the website for the store, along with her portion of the business.Dealing mainly with housewares and home furnishings, Alicia has a wonderful eye for combining the classy with the kitsch, showing the fun and colorful side of vintage, not the stuffy and straight-laced. The vintage clothing is hand picked by Kris for it’s “wearableness” and ability to mix and match with contemporary pieces. I’ve got my mind’s eye on a vintage dress I tried on when I was in the shop, and if it is as Joan Holloway as I remember it, I just may have to make a return visit! 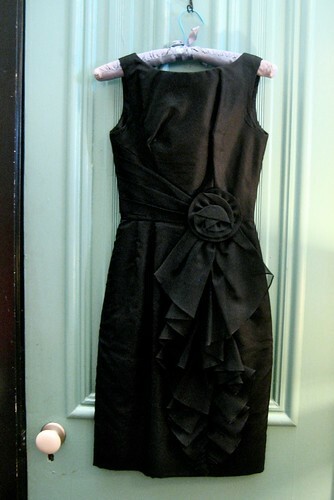 oh how I wish I could fit into this LBD (Little Black Dress)! As a quick aside one thing I just love about this shop is that the gals are genuinely friendly and pleasant to each person entering, treating customers like pals that they just haven’t met yet. This simple gesture made me feel like I could spend all day in the store (which I kinda did) but more importantly, made me eager to return. As anyone in business knows, it can be a feat to get repeat customers, but I bet that this shop has no problem with that. Remember your favorite Aunt who showed you how to finger paint with your toes, dyed your hair fuchsia, and took you to your first rock concert? My designs are like that. 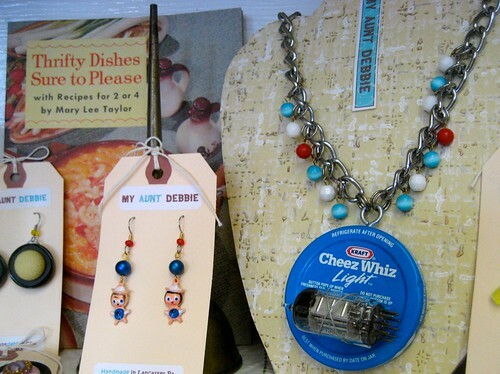 My Aunt Debbie makes great pop art jewelry with whatever strikes her fancy, appliques shirts with found art and finds the beauty and style in just about everything. My sisters are probably wary of the fact that I’m so smitten with the Aunt who dyes kids’ hair fuchsia, but if I am not that aunt (yet) I can certainly admire My Aunt Debbie’s creativity, sense of humor and aesthetic. 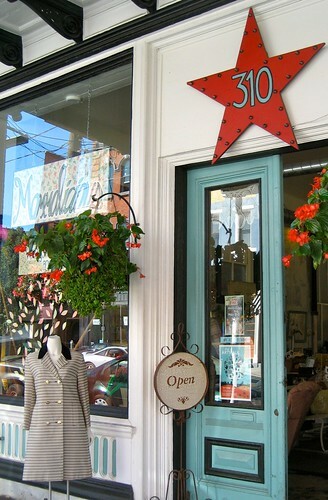 The store itself is a bouquet of happy adjectives: Spacious, bright, cheery, relaxed, colorful. 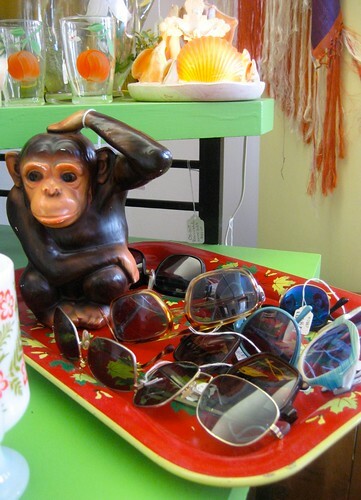 The way things are displayed shows us how easy and fun it is to mix and match eras and items to express your individual style. 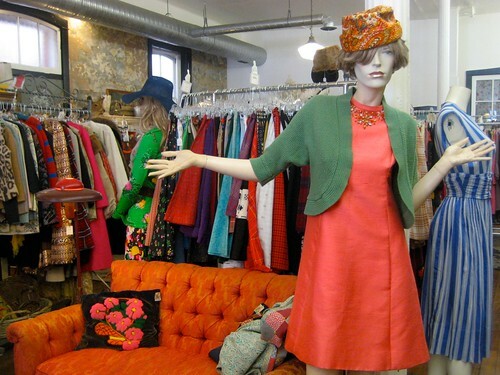 Open every day including Sunday, you’re bound to run into one of these swell gals who make this place a worthwhile vintage shopping destination. 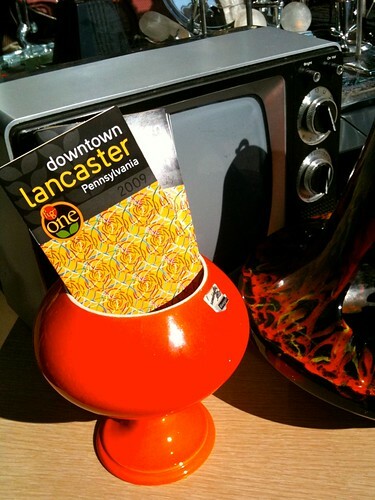 Lancaster has got a host of cool old vintage and funky places to check out, so spend the day! Mad Men Yourself in Real Life on Mad Men Mondays! If any of you folks are fans of the show Mad Men, please join me in celebrating my latest invention– Mad Men Mondays! I watched the first episode of the season last week and when I was getting ready for work Monday morning I decided to pretend that I was going to work at Sterling Cooper for the day and put on one of my vintage dresses and a pair of heels. It was fun to have a reason to pick out a special outfit for Monday, and made going back to work a little easier. I just picked up a swell dress at Mad Hatters in Adamstown (thanks Mary Deluxe of Deluxville for the tip!) and I can’t wait to wear it this week. At least Mad Men Monday gives me a reason to get a little excited about going back to work for the week. Join me won’t you?